One of my favourite things to eat is quiche. I like it hot and cold, with lots of different fillings. 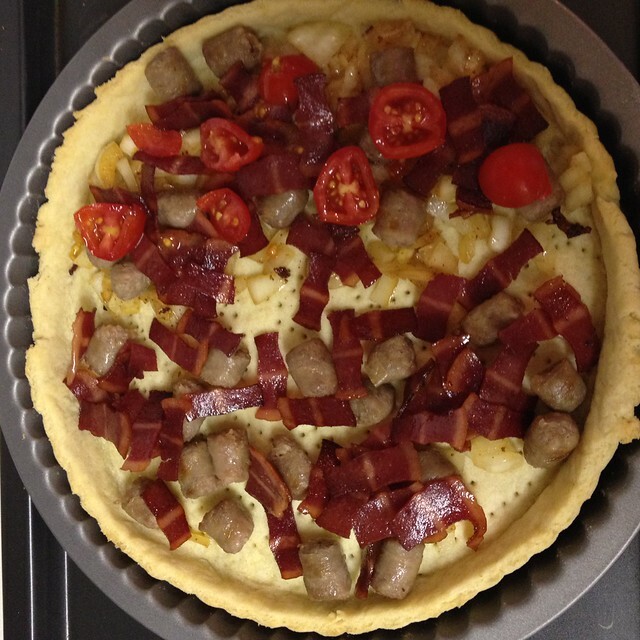 I used to love going to the deli counter in the supermarkets in England to buy a ready made quiche. I can’t seem to find any here in Alabama though, so I set myself the task of making one for dinner the other night. Add the butter to the four and rub until it looks like fine crumbs. Then add the yolk and water to mix into a smooth dough. Place onto a floured surface and knead for a minute – not too much! Pop it in the fridge for 30 minutes. Remove from the fridge and roll out to fit your flan dish, mine had a diameter of 23cm. Prick the pastry with a fork & blind bake for 12 minutes at 375F. I don’t own any baking beads/beans so I just used foil with rice and it worked just the same! 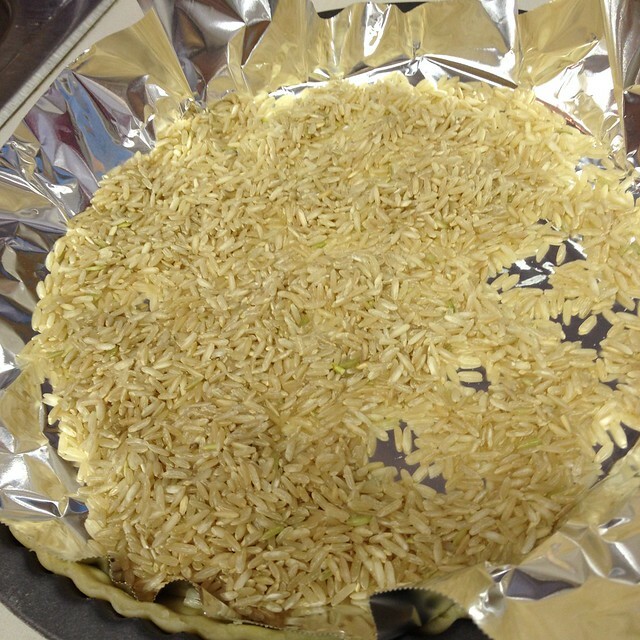 Remove the foil and bake for a further 12 minutes until the pastry has turned a light golden colour. 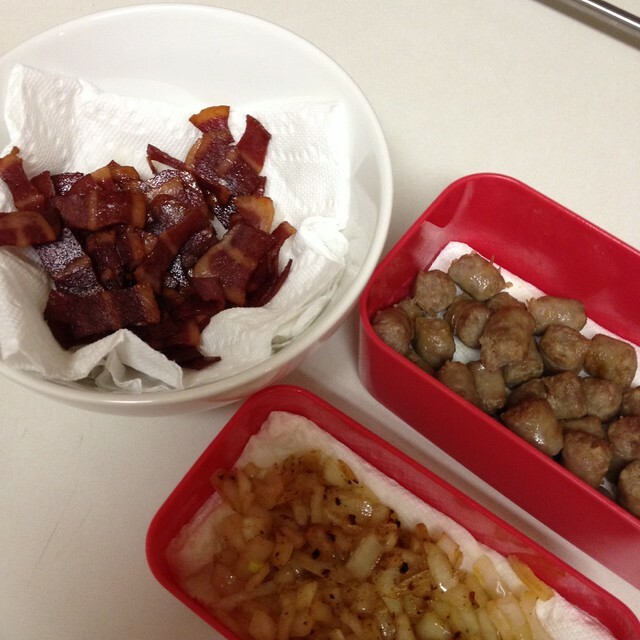 When the pastry was in the oven, I fried my sausage, bacon & onion. I haven’t put specific amounts above as it really depends on how much of a certain ingredient you want in your quiche! Adam doesn’t like onions or tomatoes so I only put them on my half ! 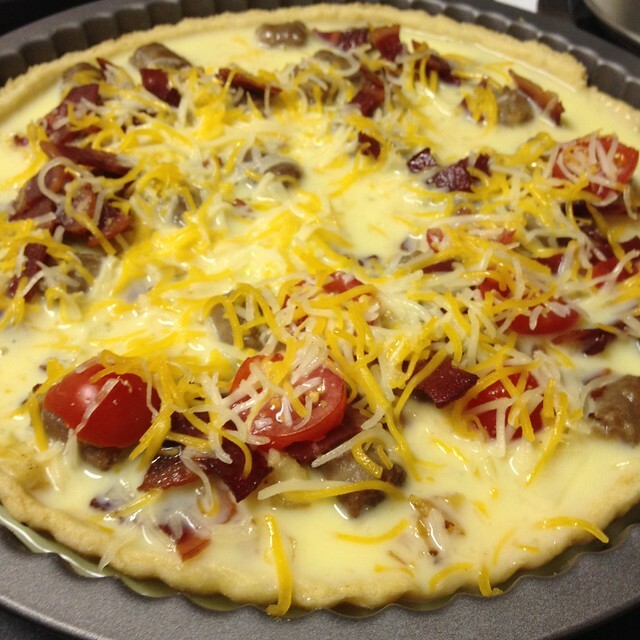 Load the quiche up and top with grated cheese. 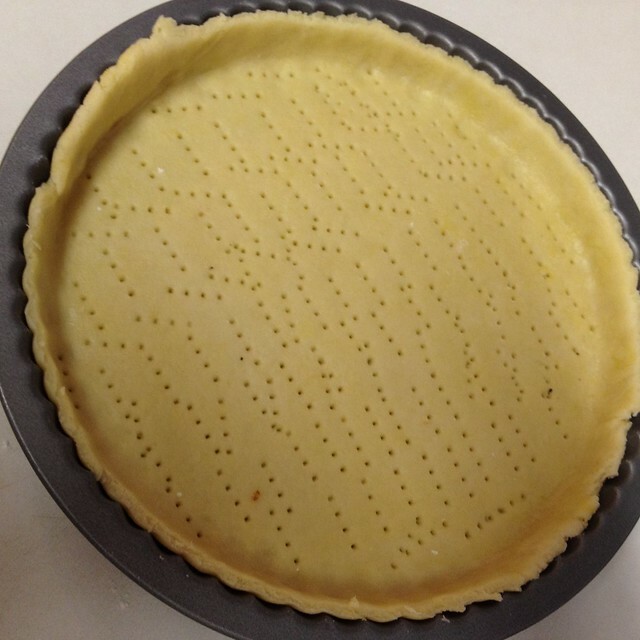 Once I had added my filling I realised that by pastry was quite shallow! I mixed the eggs and milk together but didn’t end up using it all as it would have overflowed! Cook for 30 minutes or until just set 🙂 Yum yum! 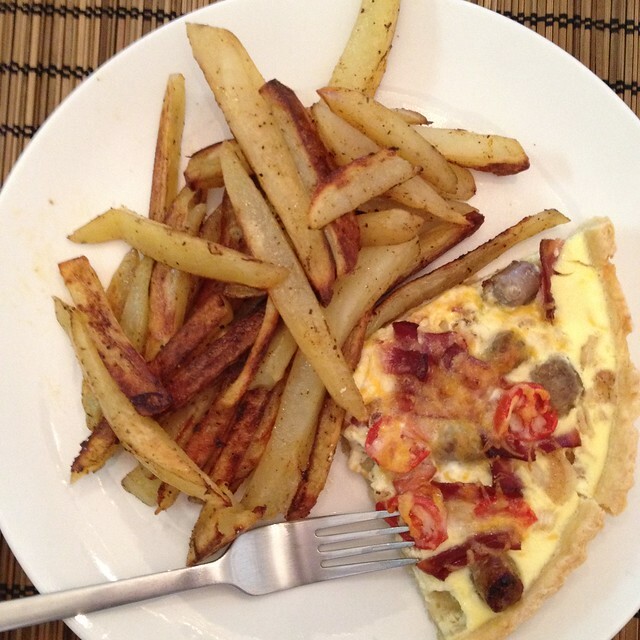 Most of our meals are accompanied by homemade chunky chips (fries!). I love these as they are so versatile depending on the flavour you are fancying that night! For these ones, I placed 2 tbsp oil (you can use any oil, even the healthy oil sprays! 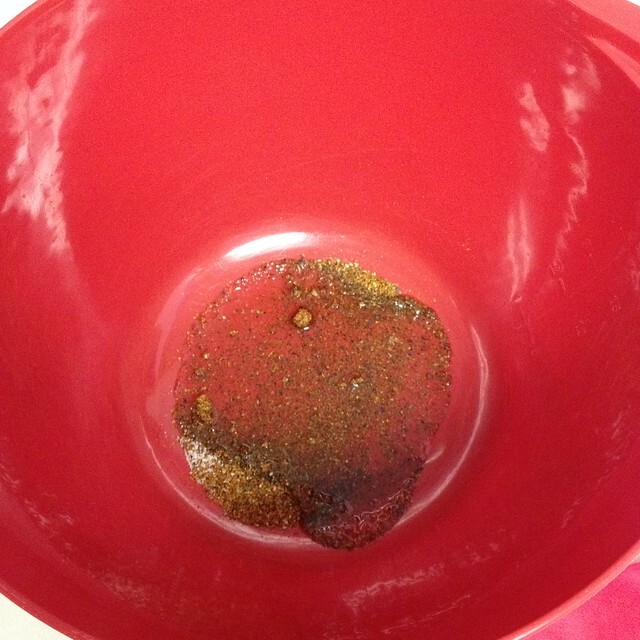 ), salt, pepper & Texas red dirt rub into a bowl. I peeled and chopped 4 medium potatoes. 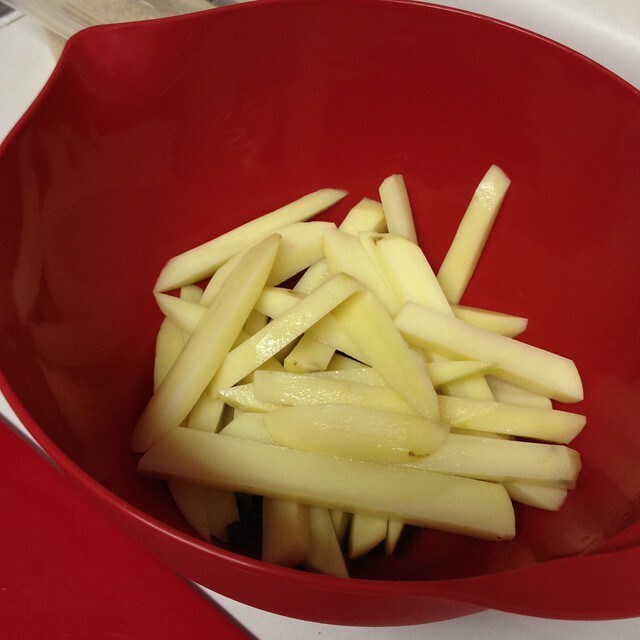 The chopped potatoes go into the bowl and get tossed with the mixture! 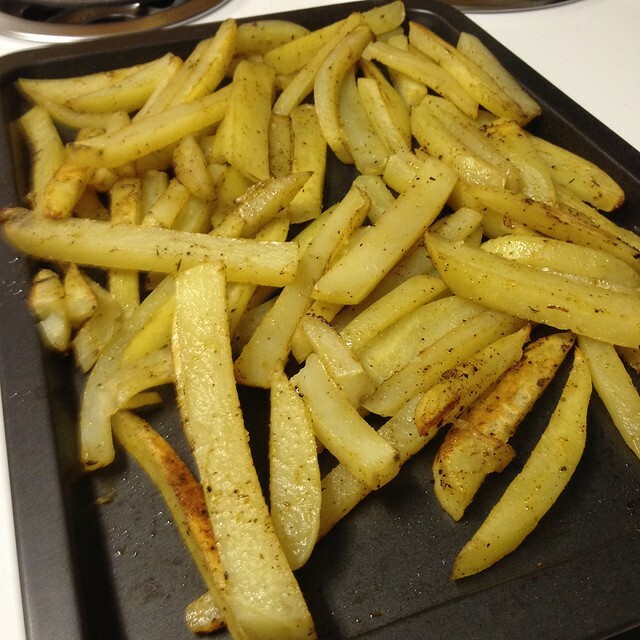 These fries need around an hour to cook at 375F. I do them for 30 minutes, turn them all over and then put them back in the oven for a further 25 – 30 minutes. Again…yummy! The combo is heavenly. No words!